Several hundred films based on Shakespearean material were made in cinema's 'silent' era. What economic and cultural ambitions combined in order to make Shakespeare such attractive source material for the film industry? What were the characteristic approaches of particular production companies and of particular national film industries? 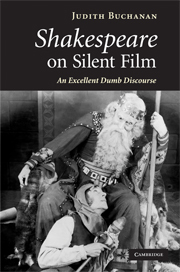 How were silent Shakespeare films marketed, distributed, exhibited and received? Through a series of close readings, and drawing upon a wealth of primary research, this engaging account tells an evolving story that both illuminates silent Shakespeare films already known, and brings into critical circulation other films not yet commercially available and therefore little known. Subjects covered include nineteenth-century precursors of silent Shakespeare films, the many Shakespeare films of the Vitagraph Company of America, the blockbuster Shakespeare films of the tercentenary year 1916, Asta Nielsen and Emil Jannings as the stars of German Shakespeare films of the 1920s, and silent films of Hamlet. Preface; Introduction: wresting an alphabet; 1. Shakespeare without words: the nineteenth-century legacy; 2. Biograph's pioneering film of King John (1899); 3. Conflicted allegiances in Shakespeare films of the transitional era; 4. Corporate authorship: the Shakespeare films of the Vitagraph Company of America; 5. Pedigree and performance codes in silent films of Hamlet; 6. Shakespeare films of the 1916 tercentenary; 7. Asta Nielsen and Emil Jannings: stars of German Shakespeare films of the early 1920s; 8. Afterword: 'No tongue, all eyes! Be silent': performing wordless Shakespeare today; Filmography: A. Commercially available Shakespeare films of the silent era; B. General filmography; Bibliography. "This is an important contribution to the study of Shakespeare on film … it is meticulous, informative and critically sophisticated, written in a clear, persuasive and appropriately elegant style. It brings new ideas and perspectives to familiar films, stimulates interest in others and overall makes an outstanding contribution to its field." "Buchanan makes a major contribution to both cinema studies and Shakespeare studies, explaining why these silent films are not just Shakespeare manqué but valuable objects in their own right. The book places the films within the legacy of Victorian entertainments from the magic lantern to the stage and uses them to open up the era of silent film-making with insights into institutions, audiences and contemporary values. Buchanan vividly brings to life a forgotten world in which actors pantomimed Shakespeare and audiences responded with enthusiasm." "Judith Buchanan’s excellent book reconnects us with a lost world of Shakespearean performance. Through detailed, wide-ranging research and a high degree of imaginative sympathy she makes an unshakeable case for the validity and thematic richness of the silent Shakespeare film. It is instantly the standard work on its subject."